UNCG is set to award more than 2,700 degrees to the university’s largest-ever graduating class on Friday, May 4, at the May Commencement ceremony. Olympic speed skating gold medalist, NBC Winter Olympics commentator and humanitarian leader Joey Cheek will deliver the keynote address to the Class of 2018. The University of North Carolina System has named UNC Greensboro Police Department Officer Taylor Trantham as its 2018 Officer of the Year. Officer Trantham received the award during the UNC Chiefs of Police Conference held on April 25 at the Spangler Center. Officer Trantham has also demonstrated a remarkable commitment to the people in the community. He has led efforts to repair bikes for local children and regularly devotes his own time and money to ensure children in an adjacent neighborhood get to experience Halloween each year. Officer Trantham also collected donations in order to send a Hurricane Harvey Relief package for the officers and families of the Houston Police Department. See full story at UNC Now site. UNCG brought out the hardhats and golden shovels last Friday at a ceremony to celebrate the official groundbreaking of the new Nursing and Instructional Building. The 180,000-square-foot facility was made possible thanks to state funds from the Connect NC Bond, which was passed by North Carolina voters in the spring of 2016. The $105 million building is slated to open in the summer of 2020. The School of Nursing, currently located in four buildings, will occupy approximately 50 percent of the building. In addition to providing more space for the School of Nursing, the facility will provide teaching and flexible laboratory research space for the School of Health and Human Sciences and the Departments of Biology and Chemistry, as well as classroom space. The building will house 39 labs, 14 classrooms, nine research suites and a community engagement center. The Nursing and Instructional Building will be located on the former site of the McIver Building, which was demolished earlier this month. “While we make way for the New Nursing and Instructional Building, we recognize that the learning, research and creative production that took place here will always remain an indelible part of our institution,” said Chancellor Gilliam. Prior to the McIver Building’s demolition, a time capsule with UNCG commemorative items from 1908 and 1959 was removed from the building’s cornerstone. See a video of these items below and learn more at this link. Visit thebigbuild.uncg.edu for more on the Nursing and Instructional Building and related construction projects. 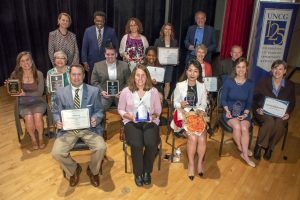 This year UNC Greensboro saw the establishment of a new set of awards: the Advising Excellence Awards, which were presented by Provost Dana Dunn in a ceremony on Reading Day. 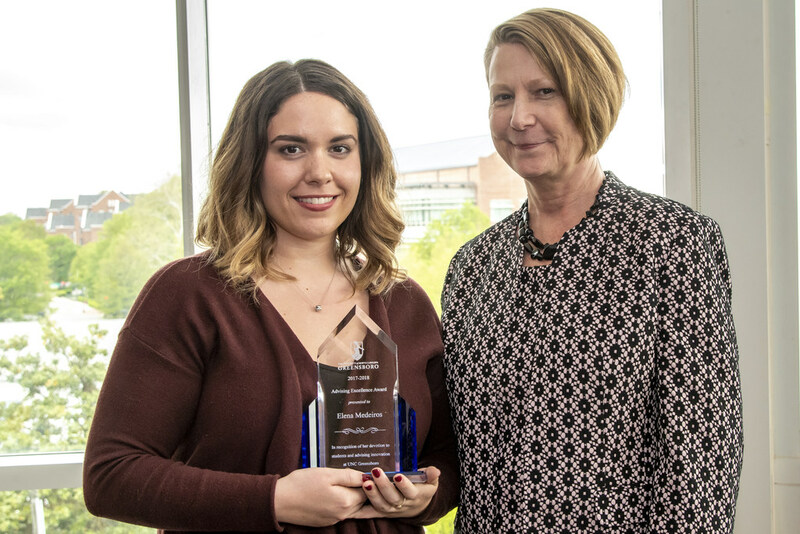 Elena Medeiros was honored for advising excellence in the category of professional advisors and Kathryn Aldridge in the category of faculty advisors. Dunn shared how during the nomination process, more than 100 student and colleague nominations identified more than 60 advisors for recognition, in enthusiastic terms. “Our student nominators reinforced that good advisors help students make connections between their own goals, the academic programs that are available to them, and to the faculty and staff that are here to support them,” Dunn said. Also recognized were the finalists in the two categories: Amanda Everhart, Adam Landreth, Caitlin Saraphis, Nic Sprinkle, Sarah Dunning, Ashleigh Gallagher, Tracey Howell and Brook Kreitinger. Vice Chancellor for Enrollment Management Bryan Terry offered his congratulations and closing remarks for the ceremony. Elena Medeiros is coordinator of academic outreach in the Students First Office, where she may work with upwards of 150 students each semester. She has been an advisor at UNCG for four years, with a focus on Exploratory students – those who have not yet selected a major. For those students, she plays an essential role in helping them find direction in college. “Advising helps students to understand their new environment and how they fit within that context – I think it’s crucial to helping them approach their education with intention. I’m the starting point where the seed gets planted. To stick with that metaphor, so much of my work is helping students do the messy work of digging around in the soil, figuring out what roots need to be adjusted, and planting the seed that will one day bloom. Often that seed takes root with the student outside the context of our meetings but occasionally, I get to be present when a student has their ‘a-ha’ moment in the room, when it clicks for them – it’s powerful to witness and it’s a gift to experience. Kathryn Aldridge is assistant professor in the Department of Human Development and Family Studies and coordinator of the Birth through Kindergarten Undergraduate Online Program. 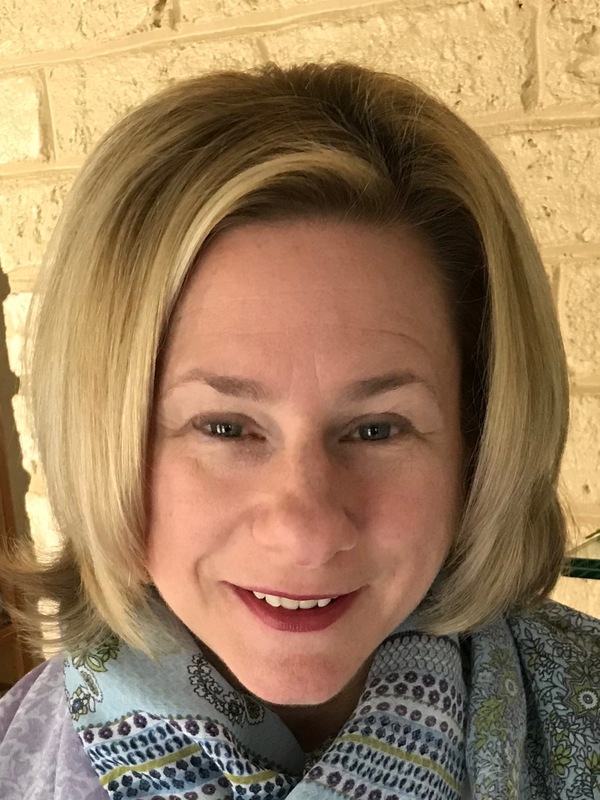 She has been an advisor for six years in her current department, and previously she was an advisor for the School of Education for five years, advising students earning a dual teaching license and degree in birth through kindergarten and professions in deafness. “Through advising, students gain a clear path to graduation, someone who knows course sequence, which courses go together and a sense that there’s somebody invested in them and pulling for them. Getting the right courses and getting to graduation is ultimately the responsibility of the students, because they’re adults, but I think that it’s a path best traveled with someone else who may know the nuances of course-planning and some things that you don’t know. So, I like that. And I think students benefit from that aspect of someone guiding them and making suggestions that they can take, or not, about what courses go together and how many hours to take – I think that supports success. You have to meld the roles of coach and advisor, and the proportions are different for different students. Creating a balance gives the best student success. RSVP to LEAP@uncg.edu for directions, parking and accommodations. A grant leadership team received funding from the Provost’s Office a year ago with a goal for UNCG faculty, students and community stakeholders to collaboratively engage with a broad array of community-serving organizations to develop common goals and common measures, and to promote, evaluate, and implement best practices for improving Lifetime Eating and Physical Activity Practices in children (LEAP Forward). One of our culminating events is this summit for UNCG researchers, students and community agencies to come together for half of a day to discuss the data we have collected thus far as well as the next steps in our plan to improve the health of Guilford County residents. This event will highlight the academic-community partnerships established and maintained through this work. What is the goal of LEAP? To improve the Lifetime Eating and physical Activity Practices of individuals and families in Guilford County. What is LEAP doing? Working with you and others to measure healthy eating and physical activity in Guilford County so that we can better understand opportunities for improvement. Why worry about indicators and measures? “You can’t change what you don’t know about.” Guilford County is program rich, yet challenged by data gaps related to timely, detailed, and accurate information about the health of our residents. Good data helps us set goals and track progress. Why is UNCG involved? UNCG seeks to transform health and wellness and involve university students and researchers in building more vibrant communities. Building on a series of community meetings co-hosted with Cone Health, a team of UNCG researchers received funds from UNCG to help advance these goals. UNCG Softball is hosting the 2018 SoCon Softball Championship from May 9-12 at the UNCG Softball Field. UNCG faculty and staff can enjoy discounted tickets to the championship by clicking the link below, then selecting which day you’d like to attend, then selecting Special Offers. Type ‘UNCG’ in the Promo Code box to receive $5 tickets. All tickets can be picked up the day of the event at the ticket booth at the entrance to the softball field. Click here to view the championship web page with game times and brackets. Seeding will be finalized after the final game of the regular season on May 6. Call the UNCG Ticket Office at 336.334.3250 for questions or to order over the phone. On Aug. 8, Campus Weekly will have its first weekly posting of the new academic year. The New Members Round Table (NRMT) of the American Library Association Student Chapter of the Year Award Committee (SCOTYA) congratulates the UNC Greensboro’s Library and Information Studies Student Association (LISSA) as the winner of the 2018 ALA Student Chapter of the Year Award. This is the first time UNCG Greensboro’s LISSA has received the award. Interested in the local wine and craft brew industry? Meet local producers and hear Bryan School professor Dr. Erick Byrd share details on how this industry impacts North Carolina. The event, Tuesday, May 22, at 5:30 p.m., will conclude with light refreshments and craft beverage and wine tasting. Space is limited, please RSVP. Find details at https://www.eventbrite.com/e/local-flavor-wineries-and-microbreweries-tickets-44597051983. This event is a UNCG Staff Senate and UNCG Bryan School co-sponsored event. From Tuesday, May 15 to Friday, May 18, 2018, the School of Health and Human Sciences will host the 9th Life Design Catalyst Coach Training Program at UNCG. See details at https://lifedesigncatalyst.wordpress.com/training/. Over the course of four days, attendees will be intensely engaged in activities and conversations that empower students (and others) to write their story, find their path, and create a vision for their future – all through their own personal journey. Attendees will leave with concrete tools and resources that can be immediately implemented in one-on-one meetings, with small groups, in a classroom setting, or as weekly workshops. They will learn and understand the strategies – through their own exploration of purpose and meaning. They will create a vision for life that allows them to take the necessary steps to become the best version of themselves and make the world a better place. The UNCG Faculty/Staff rate is $99. Want more information? Click this link: https://lifedesigncatalyst.wordpress.com/training/. The senate meeting will close with faculty senate elections. The complete agenda packet can be found at http://facsen.uncg.edu/AgendaItems.asp. The UNCG men’s golf team won its first-ever Southern Conference Championship last week. Spartan coach Terrance Stewart was named the SoCon Coach of the Year. Stewart is the first coach in program history to win the award from the conference. He has been at the helm since August, 2001. UNCG freshman Nick Lyerly won the SoCon Individual Championship, with the only sub-par score in the field. He also won the Freshman of the Year Award; a Spartan has won the freshman award five of the past six years. A league-best three Spartan golfers – Bryce Hendrix, Nick Lyerly and Josh Stockwell – were named to the all-conference team. The three all-conference selections matches last year as the most in program history. “There was a maturity level that was a little bit higher this year. It was very evident,” Stewart said. He has seen his players mature as students in the classroom, as golfers in practice, in the matches. He noted senior Josh Stockwell, who grew up in Pinehurst and returned to Pinehurst for his final SoCon Tournament. He was so focused. “It was a storybook end to his regular season,” Stewart said – as the team now heads to the NCAA regionals. And it’s the result of a continual building process many years in the making. “Our guys have practiced hard,” he explained. They’ve put a lot of effort into their academics. They’ve made good choices off the golf course, he continued. It all allows them to compete at high levels. The Spartans had posted three straight second-place finishes at the SoCon Championships before taking the title this season. They’ve had 9 top-3 finishes during Stewart’s coaching tenure. In winning the team title, UNCG clinched the automatic bid for the NCAA Regionals May 14-16, in what will be the program’s second NCAA appearance after earning an at-large bid in 2013-14. Where will the Spartans play? The selection show for the regionals is today (May 2) at 5:30 p.m. on the Golf Channel. A “watch party” for the NCAA Selection Show will be held 5-6 p.m. (Wednesday) at the Starmount Country Club (Main Clubhouse). The team and coaches will be there; the campus community is invited. Dr. Janet Boseovski (Psychology) has published a popular press article in “The Conversation.” The article summarizes over a decade of her research on children’s over-optimism and it has been republished in Newsweek, The Chicago Tribune, and The Los Angeles Times. See this link. Watch what happens when UNCG staff recovered a time capsule from the cornerstone of the McIver Building in April 2018. UNC System President Margaret Spellings visited Greensboro last Wednesday for a special State of the University Address that highlighted the system’s four Triad area universities: UNCG, N.C. A&T State University, Winston-Salem State University and UNC School of the Arts. The event, which took place at the Union Square Campus in downtown Greensboro, was the fifth of eight stops as part of Spellings’ spring State of the University Tour. The tour serves as a “progress report” for the system, which includes 17 public institutions across the state. Spellings highlighted the achievements of the system as a whole, including improved graduation rates, a $300 million increase in annual research funding and tuition rates that have remained flat or have decreased for students. Spellings discussed three key issues for the system: economic mobility, accountability and public good. The president praised UNCG for its contribution and commitment to these issues, including the new Moss Street Partnership School and the growing number of co-admission programs with regional community colleges. The address concluded with a call to make a difference – to shape the region, the state and beyond. UNCG will bring out the shovels and hardhats to celebrate the official groundbreaking of its new $105 million Nursing and Instructional Building at a ceremony Friday, April 27, at 9 a.m. The event will take place adjacent to the Foust Building. The facility, located at the site of the recently deconstructed McIver Building, is made possible thanks to state funds from the Connect NC Bond, which was passed by North Carolina voters in the spring of 2016. The School of Nursing, currently located in four buildings, will occupy approximately 50 percent of the building. In addition to more space for the School of Nursing, the facility will provide teaching and flexible laboratory research space for Biology, Chemistry and Health and Human Sciences, as well as classroom space. The new building is slated to open in the summer of 2020. Visit thebigbuild.uncg.edu for more information on the Nursing and Instructional Building and related construction projects. Rendering courtesy of LS3P Associates Ltd.
As you may be aware, last week’s tornado devastated three elementary schools in Guilford County. The structures of these schools were severely damaged and resources such as books left unusable. Working in partnership with the Guilford Education Alliance, the UNCG School of Education has organized a book drive for the UNCG community to provide these classrooms with much-needed books. How to Donate Used Books? Donate gently-used books that you currently have that are appropriate for children in grades K-5. You can bring any such books to one of our drop-off locations: Jackson Library, the School of Education building lobby and the Office of Student Leadership. How to Donate Books from an Amazon Wish List? Books purchased here can be shipped to the gift registry address, which is the School of Education’s Teaching Resources Center. The schools need these books immediately so that students transitioning schools can enter classrooms having an inviting and engaging atmosphere for learning. Ordering and dropping off books in the coming days will have the greatest immediate impact. The book drive will conclude this Friday (April 27). Learn about Healthy UNCG, the university’s health and wellness program for employees, and the university’s involvement in the Guilford County Heart and Stroke Walk on May 19. Healthy UNCG Director Stefanie Milroy was interviewed on Triad Today recently about both of these. Community-engaged teaching and learning is at the heart of the UNCG experience. Recently, English instructor Lauren Shook ’15 PhD was honored by her department with the first Hephzibah Roskelly Pedagogical Innovation Award. The award was initiated this year in honor of the professor emerita and specifically to recognize innovation in first-year writing courses. Shook has been incorporating projects related into food insecurity into her courses for several years, but this year she expanded the scope of the projects so that they shaped the academic material and the writing assignments of her two English 101 courses. The students in her spring courses analyzed articles, interviews, and documentaries on food insecurity and how it affects college students. They also wrote argumentative essays proposing well-informed solutions to food insecurity, and as a final project, one class worked in small groups to create a cookbook that contains inexpensive, healthy, easily-prepared meals. After a class visit to the Spartan Open Pantry with directors Andrew Mails and Emily Saine, the students not only continued their reading and writing projects, but also initiated a food-drive and bake sale to raise funds and awareness for the campus resource. Those projects, in turn, put the focus on writing and audience awareness, because the second class group designed flyers and social media posts to promote the projects. The classes raised more than $300 and several wagons of food donations. UNCG Auditorium was named “Aycock Auditorium” until being renamed in 2016. This week, an exhibition opens inside UNCG Auditorium that explores the topic of commemoration and the legacy of Charles Brantley Aycock, North Carolina’s governor from 1901 to 1905. The permanent exhibition is “Etched in Stone? Governor Charles Aycock and the Power of Commemoration.” It is located on the second floor foyer of UNCG Auditorium. The UNCG History Department’s Museum Studies graduate program created the work. The exhibition sheds light on Governor Aycock’s advancement of public education in North Carolina — and his support of white supremacy and his role in the disenfranchisement of black voters in the early 1900s. “Etched in Stone?” is presented in five sections — three that focus on Aycock’s actions and their effects and two that center on the process of historical commemoration and public memory. Each section portrays Aycock in his own words whenever possible, incorporating primary sources to do so. In the summer of 2016, the Board of Trustees charged UNCG’s History/Museum Studies program with creating a plan to interpret the history and legacy of Governor Aycock in the auditorium that formerly bore his name. The program’s Museum Studies graduate students, class of 2018, have worked on this topic since Fall 2016, when they began studying the power of commemoration on campus. Last year, they presented their work-to-date to Provost Dana Dunn; College of Visual and Performing Arts Dean Peter Alexander; and the UNCG Board of Trustees. Now, as their project is concluded, their work is shared with the campus community and the wider public. Going forward, the exhibition will be open during public events in the auditorium. Now, you can buy UNCG gear at a brand new “pop up” shop in the heart of the city at LeBauer Park. The “Spartan Shop @ The Park,” which opened on April 23, is located in a kiosk at the entrance to the park and is expected to be open for 1-2 months this spring. UNCG supporters will be able to buy T-shirts, sweatshirts and more as the university continues to boost its presence downtown. Hours are tentatively set at Monday-Saturday 11-2 p.m. The shop will be open additional hours to coincide with special events or programs in the park — including UNCG’s run of Movies in the Park, Friday nights this spring and summer, as well as several concert events the university is also presenting there. Olympic Speed Skating Gold Medalist, NBC Winter Olympics commentator and humanitarian leader Joey Cheek will deliver the keynote address at the university’s May 4 Commencement at the Greensboro Coliseum. A Greensboro native, Cheek won gold and silver medals at the Olympic Games in Torino, Italy, in 2006. He won his first ever international medal at the 2002 Olympics in Salt Lake City, a bronze in the 1000 meters, and has accumulated more than 25 World Cup and World Championship medals throughout the course of his career. Most recently, Cheek completed his first stint as a broadcaster covering speed skating for NBC at the 2018 Winter Olympics in Pyeongchang, South Korea. Cheek was named to TIME’s 100 most influential people, the US Speedskating Hall of Fame, and the International Sports Humanitarians Hall of Fame. He even got to be on the Wheaties box. After winning gold in Torino, Cheek turned his talents to worthy charitable causes. He announced he’d donate his Olympic winnings, totaling $40,000, to Right to Play helping refugees driven from their homes in the Darfur crisis, in western Sudan. He then challenged others to donate as well. In total, Cheek raised $1.5 million in charitable donations to aid Right to Play. In 2006, Cheek cofounded Team Darfur, an international coalition of more than 500 athletes around the globe, to continue to advocate and fundraise for the people from that region. Since ending his athletic career, Cheek has worked as a corporate speaker with dozens of Fortune 500 Companies, started a digital sports content company, and currently serves on the board of the US Olympic Museum and Hall of Fame. It is a restorative justice film retelling the 1999 brutal police shooting of 22-year-old Guinea immigrant Amadou Diallo. His film, along with others submitted from around the country, will screen at the prestigious Tribeca Film Festival in New York City on April 28 at 3 p.m. in the Battery Park Regal Theater. Only eight students were honored, from universities throughout the nation. Johnson’s film was shot in three hours in one day, he tells Campus Weekly, and the editing process took around two to three days. The actors were all UNCG students, and three have graduated since it was shown at the 2017 Campus Movie Fest on the UNCG campus. The idea for the film originated in his Fall 2017 African American & African Diaspora Studies class “Blacks in Society,” led by professor Armondo Collins. There, he had an assignment to research a victim of police brutality and create a restorative justice plan. Seeing a need for a short film telling the story, he created one. What’s next for Johnson? He has recently finished producing a new short film called “Lunch Counter,” a retelling of the Feb. 1, 1960, sit-in at Greensboro’s Woolworth. See his “41 Shots” film at https://youtu.be/Ybt9YVQIkwQ. Dr. Tara T. Green (African American & African Diaspora Studies) was presented with the inaugural Langston Hughes Society President’s Award for being a “leader, scholar, and keeper of the Langston Hughes Tradition” at the their annual luncheon, April 5, 2018. Green served as president of the organization for three years and spearheaded the successful search for the current Langston Hughes Review. Dr. Martin Halbert (University Libraries) received new funding from the Institute of Museum and Library Services (IMLS) for the “Library Diversity Institutes Pilot Project.” The University of North Carolina at Greensboro (UNCG, project lead), in collaboration with the Association of College and Research Libraries (ACRL) Diversity Alliance propose a two-year project to pilot a national Library Diversity Institute program that will address the needs of professionally underrepresented racial and ethnic groups and broadly advance diversity in U.S. academic libraries. The Library Diversity Institutes (LDI) pilot project will conduct two institutes for incoming ACRL diversity residents, as well as an ACRL diversity pre-conference for all interested parties. With guidance from a national committee of residency coordinators and experts on diversity issues, the project will design a program and curriculum to orient diversity residents to maximize their experiences as residents in the diverse organizations that make up the ACRL Diversity Alliance, as well as enabling a national network of colleagues comprising the relevant cohort of librarian residents for the institute year in which they participate. This pilot program will study and document the needs of new diversity residents who attend the institute, identify key elements that will accelerate success for these new librarians, and analyze options for long-term continuance and sustainability of this institute and workshop program. This project will take the form of a two-year continuing education project grant in the IMLS category of community anchors. Halbert is dean of University Libraries. UNC Greensboro’s Miles Davis Jazz Studies Program isn’t just about playing swingin’ tunes. It’s also about learning composition skills that can define a jazz musician’s career. On Friday, April 20, the UNCG Jazz Ensemble I, directed by Associate Professor of Music Chad Eby, will perform with visiting master guitarist Lage Lund for the Miles Davis Jazz Festival concert, and students have a hand, or an ear, in the compositions. The selections from Lund’s music, originally written for three or four instruments, have been arranged for 15 instrumental parts by UNCG student composers. The writing opportunity, which is a capstone assignment, is highly unusual for a jazz education program. During the 10 years that the festival has been taking place, UNCG jazz students have worked with musicians such as Dewey Redman, Lee Konitz and Peter Bernstein – big names in the contemporary jazz world. Often the visiting artists purchase the students’ musical arrangements to perform in the future, giving the Spartan composers their first professional writing credits. Lage Lund, who hails from Skien, Norway, has led bands at New York clubs such as Smalls and The Jazz Gallery, and at venues such as Jazz at Lincoln Center and the Kennedy Center. He attended Juilliard as the first electric guitarist in the school’s history. He has been awarded a grant from the Fulbright Foundation and took first place at the 2005 Thelonius Monk International Jazz Competition. Before the concert, Lund will hold masterclasses with the Jazz Studies students, both those composing and those who will join him up on stage April 20. The concert will be at UNCG Auditorium at 8 p.m. Tickets are available at the door for $12 for general admission or $6 for students. 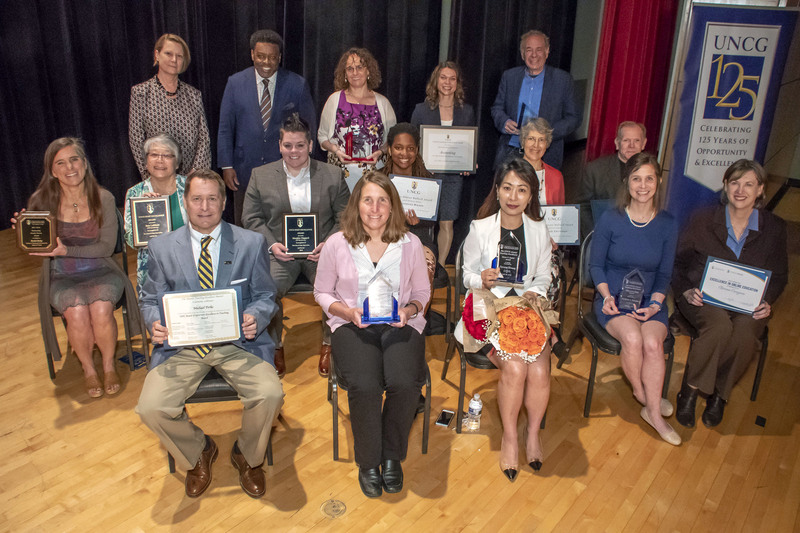 The 2018 Annual Faculty and Staff Excellence Awards Ceremony will be held on Reading Day, Thursday, April 26. The ceremony in the Elliott University Center Auditorium begins at 10 a.m. The campus community is invited. At this ceremony, the university will honor the exemplary service of faculty and staff who have dedicated years to creating the inclusive, learner-centered community we value at UNCG. Please RSVP by April 23 to rsvp@uncg.edu. Home is where the heart is, but it’s more complex than that. This week, UNCG Theatre mounts “Clybourne Park,” a play by Bruce Norris that transports us to the late 1950s, and then to 2009, in both settings taking on issues of race, identity and home. The story concerns the ownership and sale of a Chicago family property and the surrounding neighborhood’s tensions. Norris’ play is known as a response piece to Lorraine Hansberry’s “A Raisin in the Sun,” which Triad Stage produced in February, with several UNCG students in the production and an alumna and faculty playing important roles on the creative team. Although the two stories are not in perfect alignment, several characters and location details carry over to illustrate the potential future of the house and the families that live there. “Clybourne Park” is a final Master’s of Fine Arts thesis production for Jellicorse as well as for Neila K. Ettienne, who plays a 1959 maid, Francine and for the section set in 2009, the matriarch and neighborhood association head, Lena. Since Ettienne has spent the majority of her life in the Caribbean, the play required her to research American history, particularly race issues. “Clybourne Park” runs Wednesday, April 18 through Sunday, April 22, in Taylor Theatre. April 17 is a “pay what you can” preview. Tickets are available online through the Triad Stage Box Office or by calling (336) 272-0160. The University of North Carolina Board of Governors has selected Dr. Mike Perko, professor of public health education, to receive a 2018 Award for Excellence in Teaching. He will be recognized at the April 26 Excellence Awards ceremony at UNCG, and he will receive the award during the May 4 Commencement ceremony. Perko is one of 17 award recipients, who represent all 16 of North Carolina’s public universities as well as the North Carolina School of Science and Mathematics. To learn more about Perko and his teaching philosophy, click here. After a competitive national search, the Office of Research and Engagement is pleased to announce that Dr. Kimberly Littlefield will join the office as the first AVC for Research and Engagement. Dr. Littlefield has a Ph.D. in Physiology and Biophysics from the University of Illinois and currently holds the position of Assistant Vice President for Research Communication, Development and Learning at the University of South Alabama where they have an average of $60 million in funded research annually. Prior to that she served in several leadership positions including Director of the Center for Cell Dynamics at the University of Washington Friday Harbor Laboratories. Dr. Littlefield will assist with the launch of a 5 year strategic planning process; will enhance support provided to faculty, particularly the mentoring of new faculty; and will work on identifying metrics that enhance the impact of our research, scholarship, and creative activity. Dr. Littlefield will join our team Fall 2018.